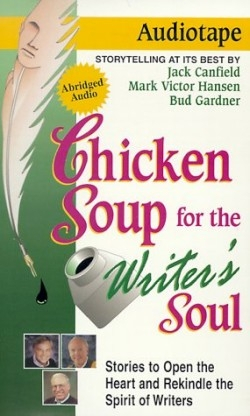 This audiotape includes twelve stories of how each author found either the courage, determination, encouragement, or the fortitude to continue writing. Read by several voices, all soothing and easy to listen to, each story demonstrates a way in which the author found inspiration to write or to continue to write. Just as there are different authors telling their stories, there are various forms of inspiration. A common piece of advice, found in “A Chat with Alex Haley” and “A Season with the Great Sinclair Lewis,” is to write continuously. According to both Haley and Lewis, no matter how one feels or what is going on in their lives, a writer should have the discipline to write something every day. The same advice from two famous and prolific writers should not be ignored. The stories “Ronnie’s Book” and “The Boy Who Saved Thousands of Lives” demonstrate how the courage of others can be an inspiration to write. In “Ronnie’s Book” the author learned first-hand that one book can change a young person, which inspired her to write stories with the hope that one may change the life of a child. Reg Green, who wrote “The Boy Who Saved Thousands of Lives” found that the power of love can spread the word, in this case about organ transplants, to save other lives throughout the world. Conversely, in “The Professor in Me,” a respected professor told Catherine Lanagan that she had no talent to write. She was devastated and did not write for years. Eventually she learned she had talent, took up writing again, and published many books. The words of one person effectively destroyed the confidence of a young writer. Whether a seasoned writer, an aspiring author, or just a collector of good stories, this audiotape is worth listening to and being inspired by.